SAM wrote: As I said, Islam has its own story of Noah's Ark without referral from other source. Noah's Ark found on Mount Judi where quran states exactly. It is a prove that Qur'an is a true word from none other but Allah, unlike Bible man made story by unknown authors. Searches for Noah's Ark, sometimes referred to as arkeology,have been made from at least the time of Eusebius (c.275–339 CE) to the present day. Despite many expeditions, no scientific evidence of the ark has been found. The practice is regarded as pseudoscience and pseudoarchaeology. BTW... "Mount Judi" is a Syrian legend, pre-dating Islam so it not Islamic original. It merely something else borrowed, something Mohammed picked up in the tales during his travels. So if there is any proof to be had, it is about Mohammed's plagiarism. The Syrians of the east Tigris had a legend of the ark resting on the Djûdi mountain in the land of Corduene (Kard, Korchayk, Carduchoi). This legend may in origin have been independent of the Genesis account of Noah's flood, rooted in the more general Near Eastern flood legends, but following Christianization of the Syrians, from about the 2nd century AD, it became associated with the Mountains of Ararat where Noah landed according to Genesis, and from Syria also this legend also spread to the Armenians. 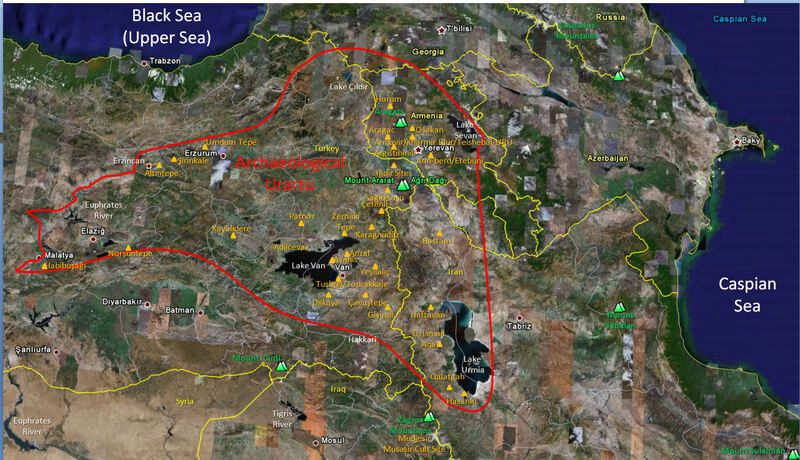 The Armenians did not traditionally associate Noah's landing site with Mount Ararat, known natively as Masis, but until the 11th century continued to associate Noah's ark with Mount Judi. And why do you not post your sources? Are you ashamed of them? I don't buy KAFIRS buillsh*t because they want to save their face. Genesis 8:4 "the ark rested on Mount Ararat" after the scientists/archaeologist have found Noah's Ark on Mount of Judi, Kafirs invented new meanings for the mountains of Ararat to save their IBLIS face. Noah's ark came to rest on the mountains of Ararat and not the mount of Ararat. In Quran says that Noah's Ark rested on mountain of Judi, "The Ark rested on Mount Judi," Surah Hud [11:44]. The actual Mount Judi is 200 miles south of Mount Ararat in southern Turkey. Genesis mentions a location called "in the mountains of Ararat" (עַ֖ל הָרֵ֥י אֲרָרָֽט) as the resting place of the ark. It does not specify the location in detail, which is what you would expect to find a legend. From other Jewish writers, such as Josephus, we learn "Ararat" is broadly Armenia, maybe Eastern Turkey, but what it meant exactly when Genesis was written, we simply do not know even that with any degree of accuracy. "Ararat" is a country though, not a single mountain. The idea of a SINGLE mountain called Arafat is a much later tradition and not part of Genesis. The "mount Judi" idea, as I have shown you, is another, separate tradition, from Syria, and not an Islamic one and not a biblical one, most likely from one of the other flood legends. Mohammed simple adapted it, like much else. And nobody has found any ark, for goodness sake. Just as nobody has found a buraq. And nobody has found any ask, for goodness sake. Just as nobody has found a buraq. Kafirs claimed that the distance between them is about 14:20 miles in an attempt to reduce the distance between the two mountains. (Mt Judi and Mt Ararat)..
You want me to watch a video on and with the old lunatic Ron Wyatt? Ronald Eldon Wyatt (2 Jun 1933 – August 4, 1999) was an adventurer and former nurse anesthetist noted for advocating the Durupınar site as the site of Noah's Ark, among other Bible-related pseudoarchaeology. His claims were dismissed by scientists, historians, biblical scholars, and by leaders in his own Seventh-day Adventist Church, but his work continued to have a following among some fundamentalists and evangelical Christians. That kind of thing is more your kind of truth, not mine. You surprise me that this kind of stuff appeals to you. manfred wrote: You want me to watch a video on and with the old lunatic Ron Wyatt? SAM, sometimes I seriously wonder if you are quite well mentally. First you present of all things Ron Wyatt as "the truth", and a few minutes later your own suggestion becomes "kafirs ****". One minute the fundamentalist Christian Ron Wyatt "proves" that the Qur'an is "from Allah", the next it is all "****". Can you not see who silly that is? What are you, a weather vane? Of course he was a faker. I mean how can anyone in their right mind believe his claims. The place he says is "Noah's ark" has in fact been investigated several times before and after him, and nothing at all of significance was found. If you look at that ridiculous list you need to ask if I believe that? I am not a complete idiot Sam. So where does that leave you with your claim that the ark has in fact been found? Hmmmm? manfred wrote: SAM, sometimes I seriously wonder if you are quite well mentally. First you present of all things Ron Wyatt as "the truth", and a few minutes later your own suggestion becomes "kafirs ****". Your hatred toward Islam makes you deny any findings in favor of Islam, even by kafirs. That's why I like to keep you and others trapped in darkness in the debate. Why should one believe these are Mathew's but not Jesus words? "back in the days ". Just because Jesus got busted, we should say these are not his words? Jesus was a human not god or anything, he made a mistake just like we all do , I think that's what happened. ALL of Matthew's gospels are Matthew's words. Jesus did not write anything and Matthew wrote some 30 years later. It would be silly to assume ALL and EVERY quote is verbatim. Nobody got "busted". That is simply just your wishful thinking. How many more times? You are drawing a conclusion from something we simply don't know. You have not provided sufficient evidence. It is not an article of faith to believe in a literal flood and a real Noah in any mainstream denomination. I have not ruled your idea OUT completely I have said it is merely your reading of the text, and not the understanding of Christians generally. It simply is not enough to draw a firm conclusion on a phrase used by Matthew when introducing the teaching of Jesus on judgement day. We cannot be certain even that Jesus used that exact phrase, and if he did, it does not imply BY NECESSITY that Jesus believed in a real Noah. That does not mean he did not, he could have done. So while your idea is a POSSIBLE interpretation, it is not the ONLY POSSIBLE one. The standard reading of it is also perfectly reasonable. It seems nothing will make you see that. I really have explained it often enough by now. I noticed at one point you wanted an EXACT analogous use of metaphor, "in the days of" followed by a fictitious character. I found you one, and you just sidestep that. Could it be you are only interested in things that support your own ideas? Not only me manfred, any person who is honest, unbiased , who want to know only the truth and have minimum level of common sense will ask god the same question, that why the hell you sent your son and have nobody recorded what he said that one can trust and rely on. Here we go, the "no true Scotsman" again. So all Christians are biased and downright dishonest. So it seems that you too have caught the bug of bashing Christians, as a way of a hobby, like glitch described. Guess what, I don't owe you a justification. I have answered you and if you don't like what I told you that is really not my concern. For my efforts to explain something I get called dishonest. Twice now. We don't have a verbatim record of the exact words of Jesus. Nor do we have a record how he cleaned his bum or what colour sandals he wore. Nor do we have a record of his exact interpretations of many texts, how he read Noah or the creation story, for example, and many others. All we do have a record of him picking up various parts of the Hebrew bible and using them teach something. What we do have is a record of what early Christian believed about him. That is what is written down. It is about the big picture, not any nit picking. If that is "stupid" to you, well, that is your opinion. The early writers concentrated on important things that touch our lives, not on silly games. Do you really think "God would send his son" to tell humanity that Noah is either a legend or real? To work that out we don't need any special help. Your example of cartoon means nothing. Nobody talks like this about characters who do not exist. Either Jesus said "back in days" or he did not and Mathew added those. Both options are not good. If Jesus said it that means Jesus believed in Noah. You may not think that way but that will be the conclusion 9/10 will reach. If Mathew added it, which is most likely the case that puts ? mark on everything we know about Jesus and what he said. We don't know what Jesus actually said and what are the words of Mathew or John etc. This is actually the big question critics have that people who wrote about Jesus were never present with Jesus. You say something to one person he passes it on to next and by the time 10th person hears that , messages is completely changed. So how credible are these gospels written years after his death. Perhaps jesus never said, 'love your enemy'. Question you need to ask yourself why the master planner god, will send his son and had no plan to record what he said and which can be credible.Did he send him for only one generation ? Manfred wrote: in the days of Yore" is another expression similar to that. "Back in the Golden Age"... I already gave you half a dozen or so similar phrases. In the days of yore is basically used to refer to an era in the past which is real and not imaginary. Same is the case with golden age. I think only Winnie the pooh uses a metaphor to refer to imaginary characters however that's a cartoon and a fiction. Fictional works will refer to fictional characters as if they exist for real. "in the days of yore" is a reference to a romanticised, sugar-coated past, not reality. It about stuff like knights, dragons and damsels in distress. The term Golden Age (Greek: χρύσεον γένος chryseon genos) comes from Greek mythology and legend and refers to the first in a sequence of four or five (or more) Ages of Man, in which the Golden Age is first, followed in sequence, by the Silver, Bronze, Heroic, and then the present (Iron), which is a period of decline, sometimes followed by the Leaden Age. By definition, one is never in the Golden Age. Kenny Loggins was a 17-year-old high-school senior, staring down his impending adulthood, when he wrote "House at Pooh Corner." The song was inspired by A.A. Milne's 1928 book "The House at Pooh Corner," a collection of short stories about Winnie the Pooh and the rest of the inhabitants of the Hundred Acre Wood. But by 1970 — when the Nitty Gritty Dirt Band wanted to record the song — Pooh had been turned into a Disney character, and the company's lawyers tried to stop the song from being released. So what we have is a real person living today using a phrase exactly like it, "in the days of..." followed by a a fictional character. Your example of cartoon means nothing. Nobody talks like this about characters who do not exist. You want en example, you got one, and then you dismiss it as "nothing". Kenny Loggins must be a nobody then. Either Jesus said "back in days" or he did not and Mathew added those. Both options are not good. If Jesus said it that means Jesus believed in Noah. You may not think that way but that will be the conclusion 9/10 will reach. 99% of Christians do not draw that conclusion, but obviously they are all biased and dishonest, so they do not count. If he said that exact phrase he MAY have believed in a historical Noah, or he merely used the story in such as way the people around him would understand it. As I pointed out to you before, Christianity is not like Islam, based on a book. This is only true for fundamentalists, not for most others. Christian beliefs are based on what is called "tradition"for lack of a better word. This is the sum total of ALL we know about Jesus, as he was portrayed by the early Christians, and later discussed and refined. Tradition is open-ended, i.e. new insights are always possible. The gospel texts are merely a part of that tradition. Sure, we cannot be sure of every little detail, but we have a consistent "big picture." In addition to gospel texts, we have writings from some disciples, from Paul and extensive oral tradition and many discussion of later generations. For Christians religion is BASED on the past but not stuck in it. Well, tell God, next time is does anything, to make sure he has a brigade of people standing by with clipboards. DESPITE of the absence of the clipboard brigade we have a very good idea of the beliefs early Christians held because they went to great length you bear witness to them. And most Christians are not really worried if the occasional detail cannot be established with certainty. DESPITE of the absence of the clipboard brigade we have a very good idea of the beliefs early Christians held because they went to great length you bear witness to them. And most Christians are not really worried if the occasion detail cannot be established with certainty. Notwithstanding, does not make it more true than the Greek myth of Deucalion and Pyrrha. Sam, Deucalion and Pyrrha is one of the Greek flood myths we have a record of. There are some similarities to Gilgamesh, did you know. It all boils down to this: the "flood event" generated a series of stories, legends around it. Each of these had an agenda. If you want to understand Noah you need to seek out that agenda. The question should not be "which did really happen", but what is the writer trying to make us think about? manfred wrote: Sam, Deucalion and Pyrrha is one of the Greek flood myths we have a record of. There are some similarities to Gilgamesh, did you know. I trust the author of the Quran, not the author of the Bible and Torah inspired by IBLIS, Children of the Devil and Father of Lies. [John 8:44] You belong to your father, the devil, and you want to carry out your father's desires. He was a murderer from the beginning, not holding to the truth, for there is no truth in him. When he lies, he speaks his native language, for he is a liar and the father of lies. So what do believe when the author of the Qur'an uses the bible as a source? And you first tell us you don't trust the bible but then you use the bible to justify this absence of trust, isn't that a bit odd? manfred wrote: So what do believe when the author of the Qur'an uses the bible as a source? And you first tell us you don't trust the bible but then you use the bible to justify this absence of trust, isn't that a bit odd? There are several... mostly Mohammed, borrowing stuff from many other sources, then also the editors of Uthman's recension who decided on the which bits belong together and in what order, and they also added bits and pieces here and there. Some parts also have got lost or have been removed on purpose. manfred wrote: Who is the author of the Qur'an? There are several... mostly Mohammed, borrowing stuff from many other sources, then also the editors of Uthman's recension who decided on the which bits belong together and in what order, and they also added bits and pieces here and there. I repeat once again...as usual you always blurt out to whatever comes across your mind... Don't lose your head and make yourself look stupid. Show me the author's name in the book of Quran. check out "circulus in probando"
Seriously SAM, who looks stupid here is for those to decide who read this. In Germany, they have a saying: "Paper is patient." Can you work out what it means? SAM wrote: Show me the author's name in the book of Quran. I'm not familiar with the binding or any introductory pages of the Koran. Is the author's name there? so it would appear the author wasn't Allah, if that's what you're suggesting - he just ordered it written.